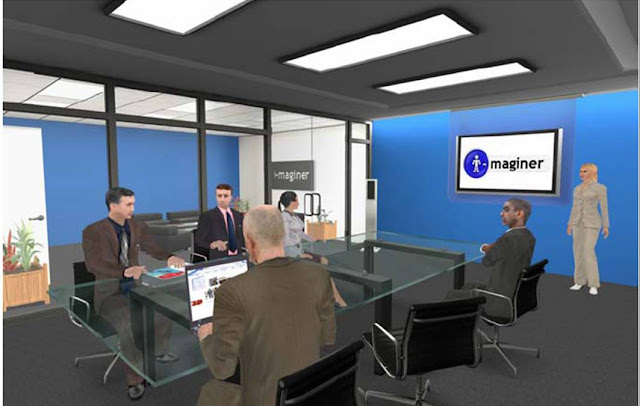 Following my prior post Serious Games As 3D Workspaces, I-MAGINER is pleased to introduce its new WebConf3D service for on demand virtual meetings! 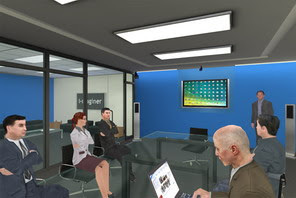 Webconf3D solution is a collaborative work environment in 3D. 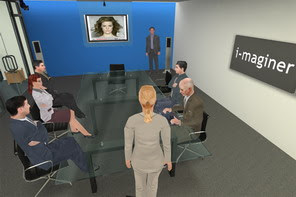 It brings together 8 people in a remote virtual meeting room to communicate and work together around multimedia documents. Webconf3D can be created on demand based on specific users needs. The service runs by subscription from one day to one year. Webconf3D can be used to meet project staff, run a network of partners, for customers’ presentations, distant training, online help desk and any type of uses based on real-time collaboration for distant people. This service is completely free until May 15, 2008. You can display multimedia documents in Flash®, Windows Media Player® and Real Player® Format, or any type of application available on your computer. WebConf3D can be used to accelerate product development, improve HR processes and interviews, present products and services to customers, facilitate project reviews and team meetings, negotiate contracts or online training. WebConf3D collaboration tools can increase organizations' efficiency. Easy to set up, always available and highly immersive, WebConf3D brings a rich set of features to make online meetings a rewarding experience.